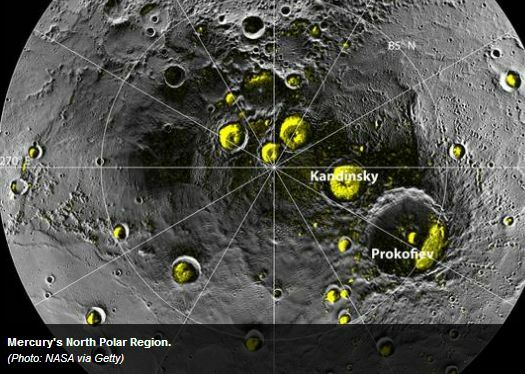 NASA scientists have confirmed a vast amount of ice at the north pole — on Mercury, the closest planet to the sun. The ice is thought to be at least 1½ feet (0.3 meters) deep — and possibly as much as 65 feet (20 meters) deep. The findings are from NASA's Mercury-orbiting probe, Messenger, and the subject of three scientific papers released Thursday by the journal Science. The frozen water is located in regions of Mercury's north pole that always are in shadows, essentially impact craters. It's believed the south pole harbors ice as well, though there are no hard data to support it. Messenger orbits much closer to the north pole than the south.